Ben Bernanke is scheduled to deliver his first formal press conference later today on behalf of the Federal Reserve. It’s a safe bet that the subject of inflation will be front and center. Although consumer price inflation is low by historical standards, there’s no shortage of worries about the direction for pricing pressures. Fed critics are quick to note that the consumer price index (CPI) is higher by 2.7% for the year through last month. More worrisome, we’re told, is that the trend is up sharply from as recently as last November’s 1.1% annual pace. Bernanke defends the central bank’s near-zero interest rate policy in part by emphasizing that unemployment is still high. Meanwhile, core inflation is far lower than the trend in headline prices. CPI less food and energy rose by just 1.1% over the past year through March, or near the lowest annual rate of change since the early 1960s. The rationale for giving greater weight to so-called core inflation is that it ignores those commodity prices that bounce around a lot in the short run, a tendency that can generate misleading signals for setting monetary policy. In fact, a number of studies demonstrate that core inflation has a better history of capturing the true inflation trend, thus the Fed’s greater emphasis on overlook food and energy prices for monitoring broad pricing trends. But nothing’s sacred in economics and so it could be different this time. If commodity prices continue rising, core inflation’s historical role as a superior measure may be due for a fall. 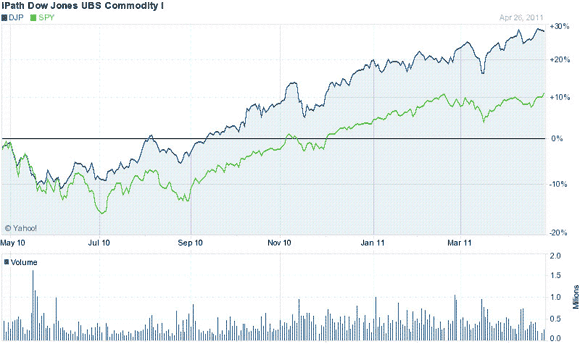 The stakes are high, given the strong rally in commodities over the past year. Consider that the iPath DJ-UBS Commodity ETN (DJP) has climbed nearly 30% over the past year, well above the roughly 10% climb for U.S. stocks via the S&P 500 SPDR ETF (SPY). Goldman Sachs and others have done such a good job of making the case for commodities as an attractive investment (on the old idea that investors were going to be paid for risk-taking), that the weight of money has pushed up the slope of the curve. This not only destroys the whole reason for investing in futures contracts in the first place, but, critically for this current argument, it lowers the cost to the farmers of laying off their price risk and thus enables, or at least encourages, them to plant more, as they have in spades. Ironically, institutional investing facilitates larger production and hence lower prices! Should both the sun shine and the rain rain at the right time and place, then we will have an absolutely record crop. This would be wonderful for the sadly reduced reserves, but potentially terrible for the spot price. It’s ironic that Grantham, who has ferociously attacked the Fed’s stimulus policy in recent years, is effectively providing some intellectual firepower for the central bank’s focus on core inflation. Grantham surely would disagree with this assessment. But if there’s a case for expecting a near-term correction in commodity prices, Bernanke’s argument for focusing on core inflation may not be as hair-brained as some critics charge. Forever is a long time, but it still arrives one trading session (and FOMC meeting) at a time.